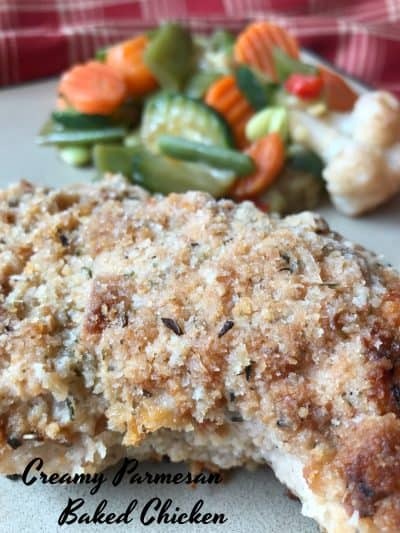 Are you looking for a fast, easy and delicious chicken recipe? Then you’ve come to the right spot. 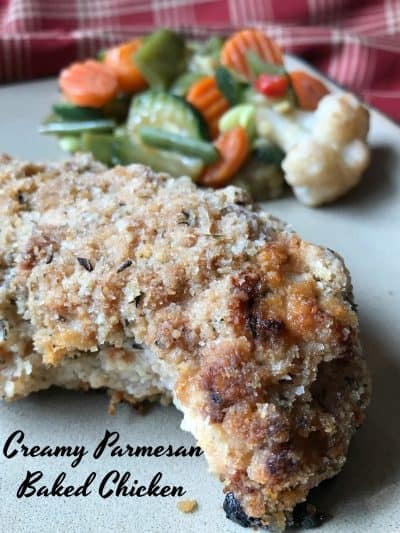 Creamy Parmesan Baked Chicken is easy to whip up and tastes delicious. 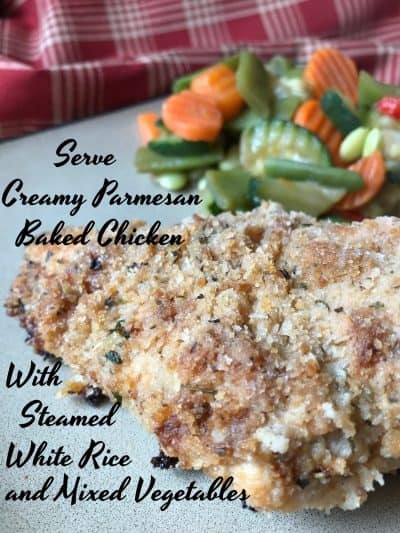 Serve with mixed steamed vegetables and white or brown rice and you have a fantastic meal. This recipe easily serves four, perfect to serve your family and special enough to serve company. This recipe uses convenient ingredients that you probably already have on hand. What I like to do with this recipe, is make it once and eat it twice. What does that mean exactly? My hubby is gone during the week, which means I have to fend for myself Sunday-Wednesday nights. That might not sound so bad but if your like me and live up north, going out to eat isn’t really an option. Instead of grabbing a big spoon, a 5-quart pail of ice cream and sitting down to watch television, I make it once and eat it twice. Monday is usually the cook for myself day. I like to make something, like this recipe, that I can make and eat on Monday and then eat the same meal again on Tuesday. I have two sectional, microwavable plates that I use. The veggies go in one section, the starch (rice, potato, quinoa etc.) in the other and finally the protein goes in the third compartment. Then on Wednesday it’s usually some sort of salad. Thursday, Friday and Saturdays are usually my ‘blog recipe’ days, when I make recipes that I will share on my blog. Recipes my husband can taste test and then take any leftovers with him to work. Friday nights have always been pizza nights at our house and always will be. Frozen, homemade or take out, it doesn’t matter because it’s pizza night! Friday night pizza night has been a family tradition for at least 40 years! This delicious chicken is special enough to serve company. Heat oven to 375 degrees. Spray 2 quart baking dish with non-stick cooking spray. 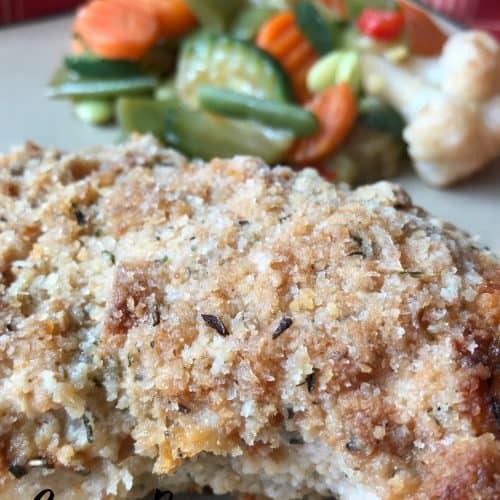 In pie pan or shallow dish, mix together flour, dry bread crumbs, Parmesan cheese, Italian seasoning, garlic powder, salt, and pepper to taste. Pour creamy salad dressing into another pie pan or shallow dish. Coat both sides of chicken breasts with flour mixture, then dip into creamy salad dressing, coating both sides well. Place in baking dish. Drizzle chicken breasts with melted butter. Bake uncovered for 45 minutes to an hour or until chicken is no longer pink inside. This recipe is made with Olive Garden Salad Dressing. 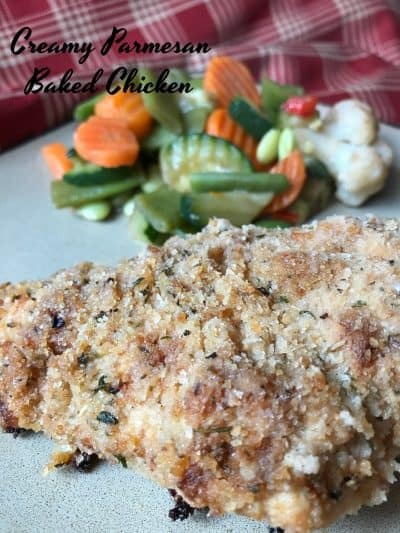 Looking for more chicken recipes? We have many that you are going love. Take a peek at these: Ultimate Chicken Sandwiches, Chicken Empanada and Stuffed Chicken Breasts Reuben Style.